John Zorbas accepts his award from AMA (WA) president Michael Gannon. Dr Zorbas, who co-chairs the Doctors in Training committee, was named Junior Doctor of the Year for his advocacy in safe working hours and leave provisions. His work led to significant improvements in junior doctor rostering hours in public hospitals. 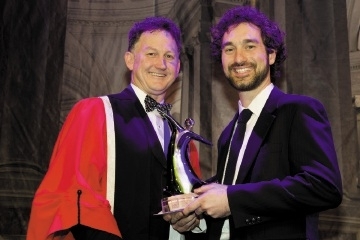 Dr Zorbas was recognised at the AMA�s gala dinner and charitable awards ceremony in August.